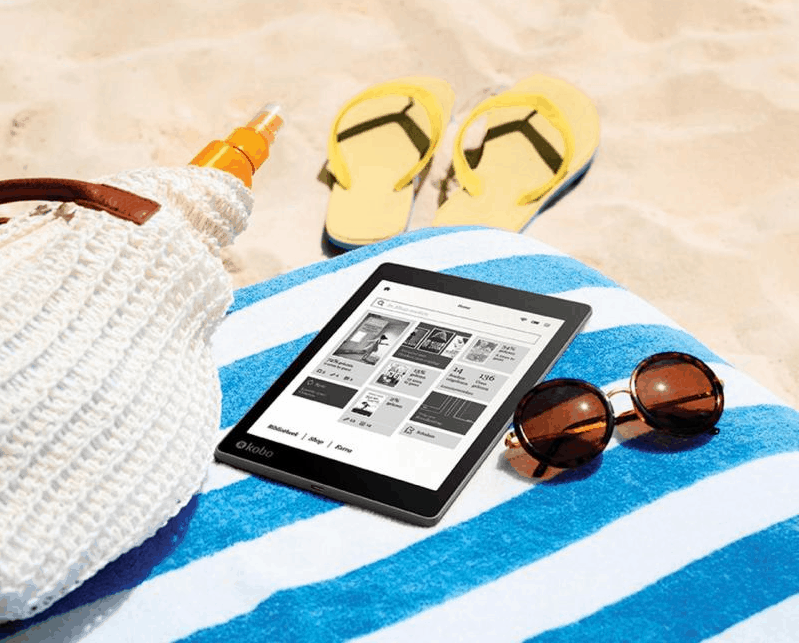 The Kobo Aura One is both Kobo's largest and most expensive ereader, and thanks to its frontlight it is arguably the best on the market. Few are touting this fact, but the Aura One has 17 LEDs lighting up its 7.8" screen - 9 white LEDs and 8 more RGB LEDs (for the night reading mode). That's seventeen LEDs compared to the Kindle Oasis' ten, or the six LEDs on the Kindle Paperwhite, but what does that mean in practice? Based on the time I have spent with the Aura One, I can tell you that it means that the Aura One has the brightest screen of any of the ereaders I have owned. As you can see in the following gallery, at the maximum setting the Aura One is at least twice as bright as the Kindle Paperwhite (2015). It's also brighter at the minimum setting, although the Paperwhite is brighter when the frontlight is turned off due to the fact that the Kindle's frontlight never turns all the way off. Note: I did not take photos of the Aura One's night reading mode because the Paperwhite doesn't have a similar feature. As you can see, the Aura One has a more even frontlight than the Paperwhite. (I no longer have a Kindle Oasis, so I am using a Paperwhite.) The latter looks positively splotchy in comparison. To be fair, the Paperwhite does cost half as much as the Aura One, but that doesn't really matter. It would only cost Amazon about a $.25 more per unit to double the number of LEDs in the Paperwhite and give it a brighter and more even frontlight. Coincidentally, that is a step Amazon will have to take with the next Kindle Voyage, or whatever device replaces it at the $200 price point. If and when it is released, that new device will need to be competitive with the Aura One, and adding more LEDs is a cheap way to accomplish that goal. A single ereader will be able to guide oil tankers through fog twenty miles away. You missed the light bulb in Settings on Paper white that allows you to turn down the brightness for night time reading. Brightness is not good for reading before bedtime. Don’t see that on my Paperwhite. Also not sure how it is relevant. You don’t see the slider bar allowing you to reduce the Paperwhite’s brightness?? More importantly, you’ve never *heard* of it?? Do you mean the slider bar shown in some of the photos? That I know of. It sounds to me like John is talking about something else which I can’t find on my Paperwhite. I was hoping he would elaborate. Amazon don’t seem to care about competing. True. Amazon only really cares about their own hardware – and the software features they decide to copy. That’s because everyone else is trying — and so far failing — to compete with Amazon. Amazon is the dominant force in the market and among the most respected/trusted brands in any business. Amazon doesn’t need to be competitive with the Kobo One yet, as the latter is so niche. Don’t get me wrong. I’m kind of desperately hoping somebody’s going to start competing with Amazon sometime soon. I’d love to see this get Kobo’s name more widely recognized. The thing is, Amazon doesn’t need to compete on hardware or software features. They do compete on usability and reliability. Kobo focuses a lot of effort on niche features (waterproofing! Yay?) but a bit less on stability, bug-stomping, and the bookstore. Note the breathless announcement of Overdrive integration vs the reality of how it actually works. Everything is a trade-off, nobody can be all things to all people. Amazon and Kobo both choose their battles carefully. They just choose different battles. It will interesting a comparison between The kobo aura one and The Onyx boox i86 hdml plus also. If it’s the brightest screen of any ereaders you’ve ever owned, why are so many sites (allesebook.de for example) reporting that the screen is considerably dimmer at 100% compared to other popular ereaders including the Paperwhite 2015? No idea. I’ll go ask. What’s interesting about Alles eBook is that they measured the brightness in terms of light emitted per square meter. Since the screen on the Aura One is so much bigger than 6″ screens, it can throw out less light and still seem brighter. Thanks for making me look into that! Even if the Kobo One can get brighter than Paperwhite, I have never used full brightness on the Kindle because the lower light setting work fine for me. Using more LED lights does seem to help with evenless of the display.